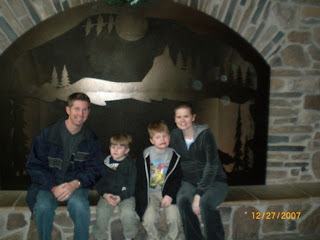 The day after Christmas we decided to have a fun stay at the Great Wolf Lodge in Kansas City. We invited Ben and Kelly and Grandma and Grandpa Little to come join us. We started the day with shopping and eating lunch. 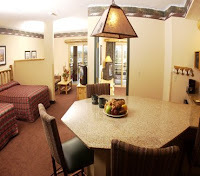 Then we checked into Great Wolf Lodge and put on our swimming suits. Unfortuantly none of my pictures from the water park turned out. But we had a great time. Damon and Adam went down the big slides. Xavier and I went down the smaller ones. I technically wasn't supposed to go down any of them since I am preggers but couldn't resist. We had a super nice suite that fit all of us in it. We generously gave Adam's parents the separate bedroom. Which worked out best for everyone since they snore so LOUD! That night we went to the T-Rex restaurant for dinner. The food is pretty good and the boys love it so...we have gone a couple times and it is just pretty darn cool. 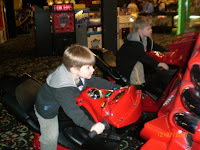 The next morning we got up and took the boys to the game room for one more game, toured the front part of the lodge and went shopping a little bit more. We bought some nice outfits for Aiden and then headed back home. 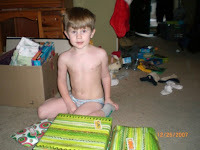 Damon with his presents at our house. Xavier with his presents at our house. Xavier and Grandma Little readin the book she wrote. It has been a lifelong dream of her's to write a book. Adam talked her into writting it a while back. He then got Ben to illustrate it. We are going to publish it for her as her 60th Birthday present. This was the first time she saw it. Xavier immediately saw it and asked her to read it to him. As soon as it was over, he said, "Will you read it again Grandma?" This insuring his spot as the favorite grandchild FOREVER! Christmas morning we always get up and unwrap our presents from each other and do stockings. Then as soon as we are done we pack up and drive the 2 blocks to Adam's parents and celebrate the rest of the Christmas Holiday with them. First we unwrap presents, then have dinner, and then we spent the rest of the evening talking, laughing, and playing games. We always spend Christmas Eve with my family. We start out going to the Christmas Eve service at the Baptist Church and then coming home for treats and presents. 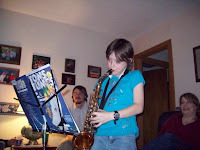 This year Jordan treated us to four songs on the saxophone, I taped them and was going to post it...but they are really really loud. Anyway, she did a great job. My dad also reads the Christmas story from Luke as well. 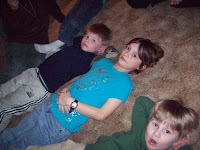 The boys love their cousin Jordan and copy her allllll the time. This is the three of them listening to Grandpa. 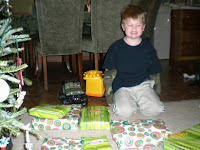 We had already received our presents from the parents the day before. 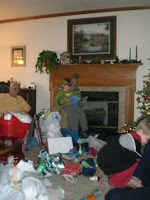 But we hadn't given them their presents yet. We also exchanged presents with my sisters and their families. 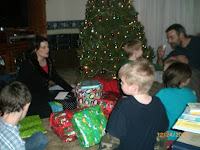 This year we celebrated Christmas with all my sisters and brother the day before Christmas Eve. 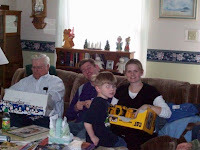 So this is when we got our presents from Dad and Lois. Last year they bought my teenage nieces very pretty diamond necklaces that made us sisters a little (a lot) jealous. So this year, we demanded jewelry...but in a very sweet keepsake kinda tone! 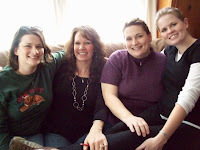 Here me and three of my sisters displaying our necklaces. 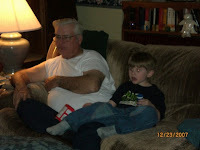 My Dad and Xavier watching TV and eating peanuts. Everytime we go to my parents house Xavier's sits with Grandpa Prewit and eats peanuts. Damon playing Boxing on Uncle Ben's wii is just too funny. Adam has to hold him back other wise he moves closer and closer to the TV and we get concerned he is going to punch right through the thing. 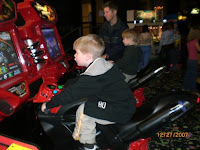 The kid is pretty good at these games, it must come through the Dolezal bloodline. The boys were playing with these candy cane lawn ornaments that Grandma and Grandpa Little gave them. They had them looped under their butts and was fighting with them. Creative huh?